Lydia Go’s sinigang na lechon is the best I’ve ever tasted; her arroz caldo with lechon skin, instead of chicken, an epiphany. God knows how many reincarnations of leftover lechon she can create so masterfully. Tastes like these never leave the memory. That’s why, last Christmas, I squirrelled some scraps of the roasted pig and channeled Lydia Go as I cooked sinigang na lechon for the first time. Is that it, just add more taro? No other secret ingredient, no extra rituals, no conjuring of spirits? And isn’t adding more taro to thicken sinigang soup already public knowledge? Dagdagan mo ng gabi… she said softly. But knowing how much more taro to add to a pot of sinigang requires an instinctive grasp of alchemy, a cellular memory that probably goes back to the invention of fire and the discovery of how it transforms the enzymes in a piece of meat, or a root. It’s not so simple for the less gifted, more so for the latecomer in the kitchen, like me, who will need years of trial and error to hone such instinct and, eventually, trust it. Now I get it. Thank you, Tita Lyds. Bagoong: Ohhhh, The Smell Of It! Visit any Filipino kitchen and you’ll find this holy trinity: patis (fish sauce), suka (vinegar) and – no, I’m not including toyo or soy sauce in this list as that it is really a culinary adoption from the Chinese – but the third most ubiquitous Filipino sauce or condiment, the bagoong. It’s a paste made from shrimp or sometimes fish, pungent and dry (or wet, depending on the province or region it comes from) and rather similar to the belachan of our asian neighbours. Bagoong is the base, the flavor enhancer in many Pinoy dishes, without which kare-kare or pinakbet is just never the same, nor green mangoes as enjoyable, and my favorite pork binagoongan, well, a misnomer. So I cooked Sitaw at Kalabasa with Bagoong and, for the first time, Pork Binagoongan. 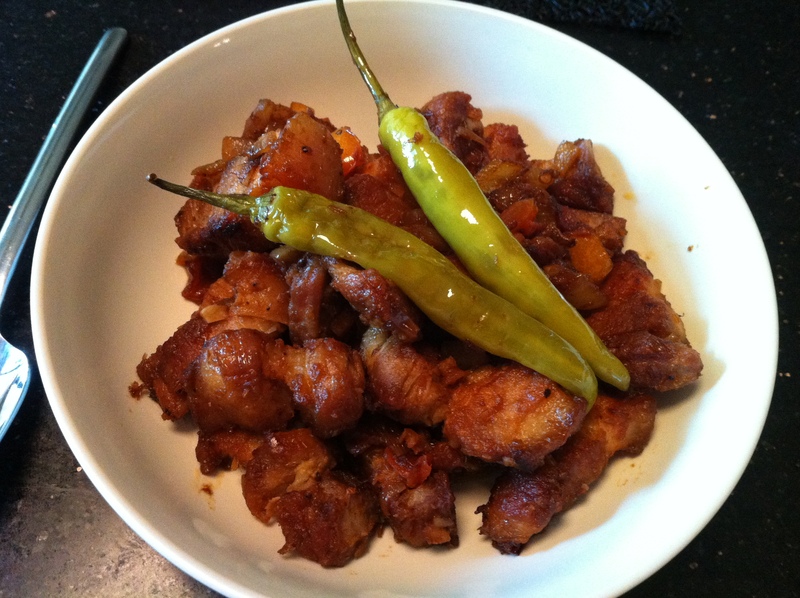 There’s really no need to refer to a recipe to cook pork binagoongan. Just sauté some bagoong in garlic, onions and tomato, drizzle some lemon juice and, at the last few minutes of cooking, add the pre-boiled slices of pork belly. For my version, I first boiled, dried, then fried the pork before adding them to the sautéed bagoong – as I preferred my pork crunchy. Of course, I love things with a lot more zing, so I also threw in a couple of finger chillies to the mix. This I served with a side dish of steamed bok choy – a perfect complement of bland and salty, green and brown, good and bad. My friend and food taster C. suggested, though, that I added more bagoong – for texture. So I took a mental note – to top my next dish with a bit more sautéed bagoong – for texture and, yes, flourish. Ohhhh, the smell of it!